Eric: Sour beers are one thing. I can even handle beer with spices. But a sour beer made with spices and salt? No thank you. What’s that? You enjoy drinking salt water? But you’d like it even more if it also had the sourness of 10,000 lemons? Then this beer, a gose is for you! A gose is a style of wheat beer made with salt and coriander. I thought it was incredibly sour and ickily salty. It was the combo of salt and sour that did me in. Imagine sour patch kids covered in salt instead of sugar. But just to be clear, I’m not saying this is a crappy beer. I just think the style is gross. I could only manage to drink half a can. But lots of people seem to disagree. What about you? Do you like salt and ew with your beer? Andrew: I think this a fair review of a beer you don’t enjoy, Eric. I don’t blame you for disliking it—it’s VERY sour and I know you’re just starting to enjoy the sour styles. It takes a long time to drink one can of this gose, because it is def a sour bomb! I happen to love this beer, though. The Leipziger Gose is the gold standard of this style. It is much less sour than the Westbrook Gose, and I bet you’d (Eric) like the Leipziger a lot more—it’s much more refreshing and MUCH easier drink. 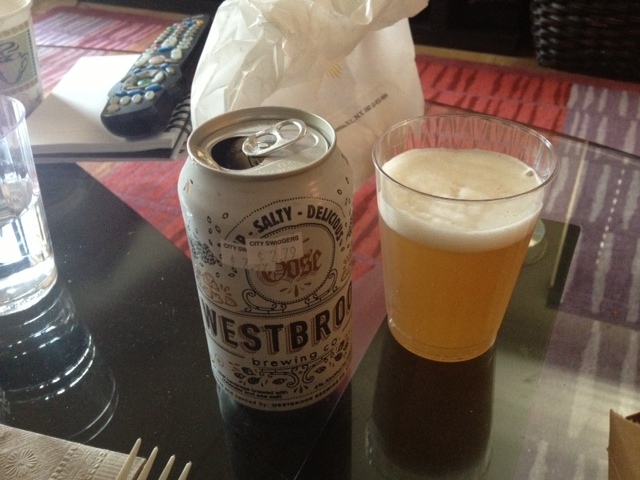 One of the reasons I love the Westbrook version is the STRONG coriander flavor and aroma that is much more subtle in the Leipziger Gose. It’s a very pumped up version of the Leipziger—more sour, more spice and more salt. I like that it’s salty. I don’t get a salt water flavor at all, to be honest, but it’s def salty. I find that the salt makes it more refreshing—kinda like Gatorade . . . electrolytes! I enjoy flavor profiles in food that mixes salty, sweet, and sour and I think this has all of those.